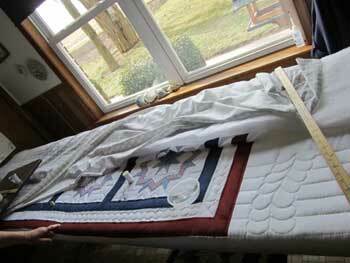 This Red White and Blue Embroidered Amish Quilt measures approximately 97 x 107 inches to fit your Queen size bed. Embroidered Quilts are cherished for the amount of time and love that is displayed in all the handwork. Anna K, our Amish Quilter, did all the work on this Red White and Blue Embroidered Amish Quilt, embroidering in the evening by her gas lantern, and doing the hand quilting during the day in front of her large window where she can look out on the birds. Anna K is my very good friend and neighbor, and makes the best pies in the valley. She lives in a small wing off her daughters home. Red White and Blue Embroidered Amish Quilt has approximately 5-6 handquilted stitches per inch. You can see the photo of this quilt in her frame being quilted, and you can read about Anna in our Meet our Amish Quilters information page. Please note, that the blue dots are still visible. These dots are the guide for where to handquilt, and will wash out.